The dining scene in Danvers Square has seen quite a revitalization over the past year, and the leader of the pack is Nine Elm American Bistro, which has garnered a loyal following since Matt and Jean Sanidas opened the doors last September. Our server was friendly, attentive, and quite happy to let us linger over the menu. After ordering a bottle of wine, we settled on the Prince Edward Island mussels, sautéed with parsley, lemon, garlic, and white wine ($8) and the summer vegetable tart baked with goat cheese and ricotta ($8) to start. The tart was unexpected; instead of the sautéed veggies we imagined, it was a pastry shell with a cheesy, almost quiche-like filling. While tasty, it lacked a certain oomph. The mussels, however, were a memorable standout— lush and delicious. The shellfish was fresh and the jus perfect; it deserved to have every drop sopped up with the wonderful grilled bread that accompanied the dish. For entrees, we chose the pan seared sea scallops with spinach-basil risotto and sweet corn butter sauce ($24) and grilled filet mignon with yukon gold mashed potatoes, blue cheese butter, and a red wine reduction ($26). Once again, the seafood was fresh and cooked perfectly. The scallops were expertly seared, and the risotto had a wonderful light pesto flavor that tasted of summer. 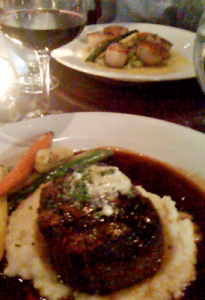 The steak was marvelous with a slightly smoky grilled exterior and melt-in-your mouth interior. Matt Sanidas’ secret to making red wine reduction is mystery, but with a taste like that, I bet the recipe is kept under lock and key. We didn’t really need dessert, but we were having such a lovely leisurely meal that we decided to prolong it by ordering the flourless chocolate torte with vanilla bean ice cream ($6) The torte was rich and dense and quite good, though we regretted not ordering the profiteroles when we saw a delectable trio of them served to an adjacent table. Oh well, next time. 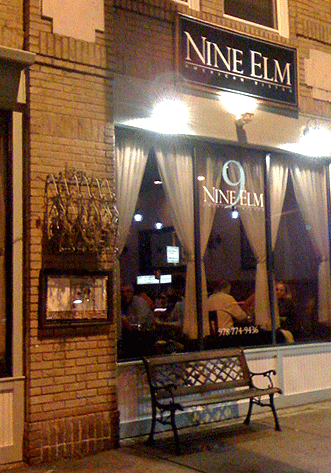 And where Nine Elm is concerned, there definitely will be a next time. Some may find the idea of an upscale bistro in Danvers Square a bit surprising, but with meals like these, it’s certainly worth investigating.